Before the cattle were fenced out of the wetlands on the Crescent J, most of the native ferns and underbrush were eaten and trampled into the mud. Simply fencing the cattle out made a huge difference in those ecosystems, allowing them to recover. Florida has been ditched and drained for more than a hundred years, lowering the water table and depleting both shallow and deep aquifers. Most cypress domes, saucer-shaped wetlands forested with pond cypress trees, had ditches cut into them to allow timbering and grazing. On the Crescent J, efforts have been made to reverse the destructive effects of draining by allowing the ditches to degrade or plugging them. As a result, the local water table is rising and the cypresses are regaining health. Florida has many invasive species, both plant and animal, that out-compete native species, mostly due to the lack of the controlling species which usually did not come with them from their homelands. 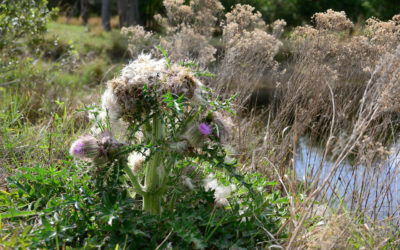 Plant species are often spread by deer, feral hogs and machinery which has been working where seeds and roots of those species can get into the machinery and travel to new locations. Some of the most troublesome invasive exotic or alien species on the Crescent J are Tropical Soda-Apple, Cogongrass and both Asian and European (Old World) Climbing Ferns. Brazilian Pepper has not yet become a problem, but every year, it comes closer geographically, especially along highways. Vigilance is essential. All invasive exotics must be fought whenever and wherever they crop up, as soon as possible, to prevent them from spreading out of control. An occasional Tropical Soda-Apple and Canadian Thistle can just be dug up, but if they become established, large patches must be sprayed with herbicide, as must Cogongrass and the Climbing Ferns. Climbing Ferns can be prevented from taking root in wetlands if water is kept at a depth sufficient to keep the roots flooded. 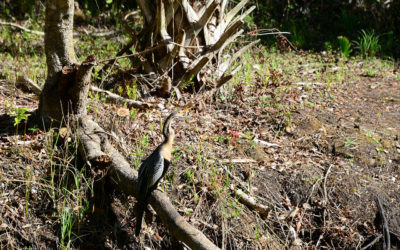 That is enough reason by itself to restore the hydrology in the cypress domes and sloughs. Alligators have recovered from near extinction to the point that most bodies of water again have alligators in them. The size of the lake, pond, canal or waterhole determines the size of the resident gator. Large lakes could harbor many alligators, though we will never see the reptiles in the numbers that the first European and American explorers of Florida saw. The Crescent J has a number of ponds that have been dug to supply fill for roads and building sites. These ponds were purposely dug deep enough to provide habitat for alligators. Some have been stocked with fish and frogs. 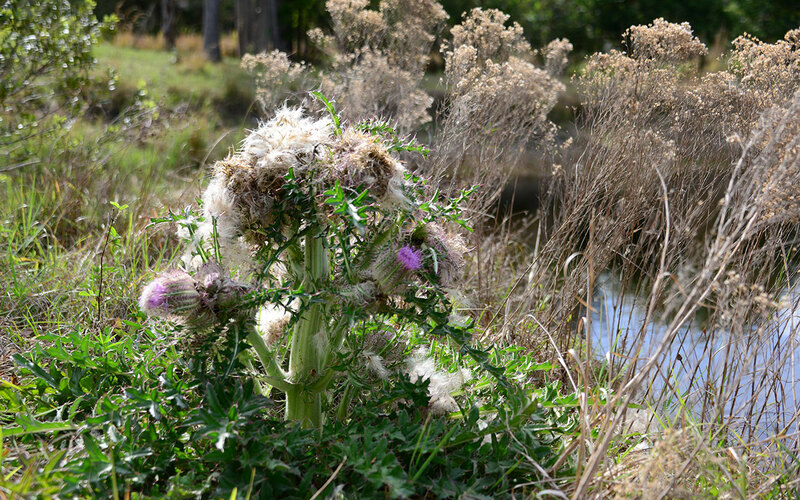 Canals, ditches and ponds are occasionally cleared of vegetation when plants have become too dense, as alligators need some open water. The dug ponds have islands with a few trees and shrubs to provide safe nesting habitat for wading birds. 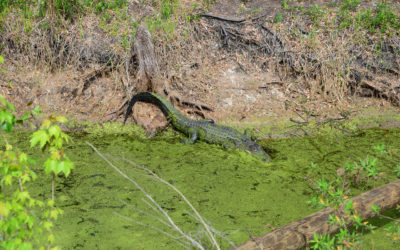 Alligators in the ponds protect the islands from bobcats, coyotes, dogs and raccoons. Even panthers and bears will avoid swimming in alligator populated water. 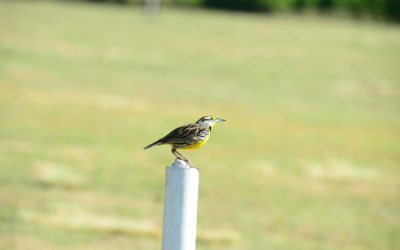 About 130 thousand trees of native species have been planted on the Crescent J Ranch since 1990. Live Oak, Southern Magnolia, Southern Red Cedar, Bald and Pond Cypress, Longleaf, Loblolly and Slash Pine make up the majority of those native Florida tree species, but Tupelo, Water Hickory, Pignut Hickory, Water Oak, Swamp Bay, Swamp Chestnut Oak, Sand Live Oak, Chapman’s Oak, Turkey Oak, Hercules Club, Acacia, Mulberry, Cabbage Palms and Sweet Gum have also been planted in their proper locations to restore disturbed habitats. 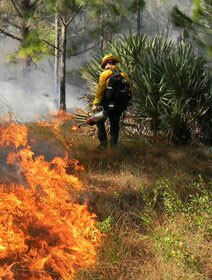 In addition controlled burns are utilized to keep the land safe from uncontrolled fires. Controlled burns also help prevent dramatic shifts in the environment, like a prairie ecosystem being overrun with trees and becoming an oak forest, crowding out the prairie wildlife. Continue reading about animals and fire. 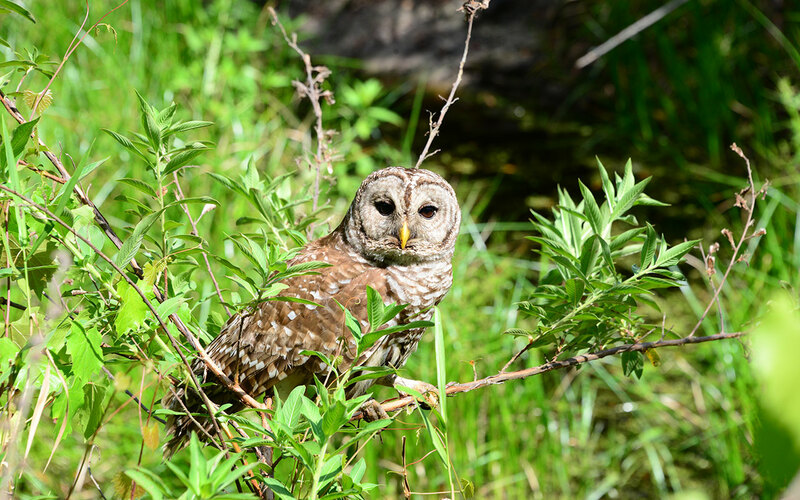 Forever Florida remains a safe and beautiful habitat full of rare and endangered birds, animals, and plants. 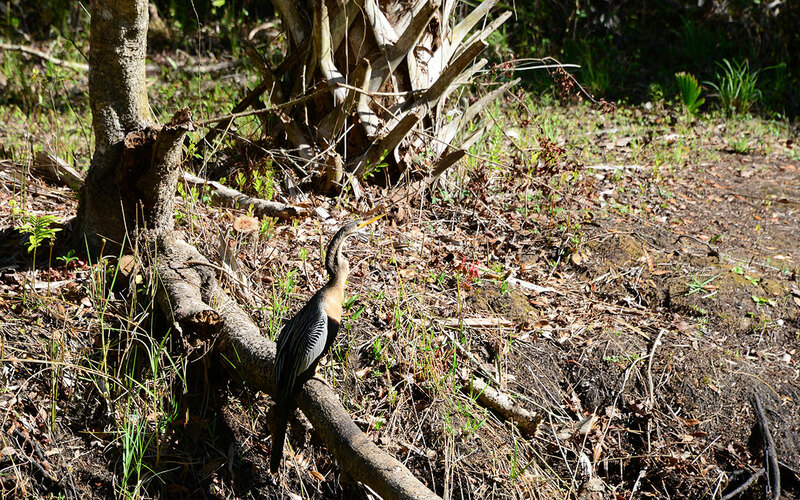 Learn more about ecological efforts of Forever Florida. What happens to the animals during a fire? It is amazing how little the wildlife suffers from fires. Americans have been conditioned to believe that fire is always bad, whereas natural fires and controlled burns done in the natural fire season are beneficial to animals and plants alike. We can thank the Forest Service’s Smokey the Bear’s message: “Only YOU can Prevent Forest Fires” and the movie BAMBI for that common misconception. Deer are quite nonchalant about fires, grazing until the fire is close and easily moving on ahead of it into some wetland such as a cypress dome. Just as the plants that live in ecosystems where lightning-caused fires are normal have adapted to fire, so have the animals. Animals that have moved into such systems lately, such as armadillos in Florida, have not had the time necessary for natural selection to work its evolutionary magic on their species. The only skeletons we have seen in our burned areas after a fire have been those of armadillos, except for once when a male gopher tortoise skeleton was found – upside down, indicating that that gopher had lost a battle with a rival who turned him over and left him to die. Armadillos dig burrows and presumably remember where their burrows are, but somehow don’t know what to do when a fire approaches. Native Florida animals, including insects such as grasshoppers, katydids, beetles and other flying insects move quickly away far ahead of an approaching fire. Mammals and reptiles head for the safety of their own or gopher tortoise burrows, waiting until the fire has passed in close company with otherwise natural enemies. Rabbits and rattlesnakes, mice and foxes might all be sharing the gopher tortoise’s hospitality. Ground-nesting birds such as quail and vultures might lose eggs or nestlings from fire, but if the fire is in spring or early summer, the adult birds, that have flown out of the fire’s reach, will nest again. Florida has a unique climate with weather patterns influenced mainly by the fact that Florida is a peninsula that straddles the tropic and temperate latitudes. The state experiences both tropical (summer) and temperate (winter) weather throughout the year. Florida is mainly affected by high-pressure systems. Fair weather and cool air dominate most of the year; only occasionally, mostly in the winter, but also most dramatically in summer or fall, as with hurricanes, do low-pressure systems of high humidity, cloudiness and storms, pass over Florida. 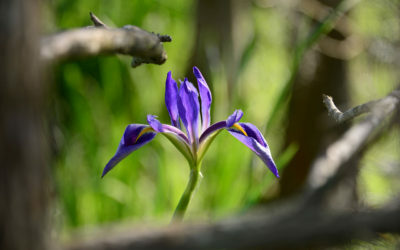 Spring officially begins on or about March 21st (Spring Equinox). Cold fronts are still sweeping across Florida causing thunderstorms and showers. Spring is relatively mild and sunny. Summer begins around June 21st. At this time, the Bermuda High, bringing heat, humidity and summer storms, replaces cold fronts. During this wet season, Florida has average daytime highs in the 90’s. Fall begins around September 22nd. In Central and South Florida, September is still a summer month with temperatures in the 90’s. It is also the wettest month of the year. Around October, Florida usually starts to dry out with cold fronts cooling the state. By November, the state normally experiences mild, sunny days and cool nights. Winter, the shortest season in Florida, officially starts on December 21st. Cold fronts increase, bringing breezy, cool days. Central Florida has average daytime temperatures around 65 degrees.